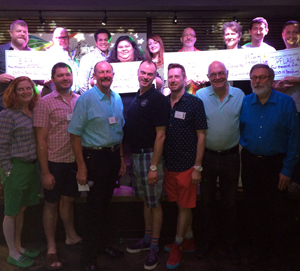 The Diana Foundation President, John Danielson III, in the continuing tradition of the sixty-one years of the organization’s philanthropy to the GLBTQ community, presented five checks, each, in the sum of $4,500 to five community service organizations. A grand total of $22,500 was distributed at the event. The five beneficiaries are Botts Collection of GLBT History, Inc., Lesbian Health Initiative (LHI), Parents and Friends of Lesbian and Gays (PFLAG-Houston), QFest Gay and Lesbian International Film Festival and Seniors Preparing for Rainbow Years (SPRY) at the Montrose Center. Mr. Larry Criscione, Botts Curator, Ms. Liz James, CEO of LHI, Mr. Jeffery Faircoth & Mr. Steven Bratsen, Presidents of PFLAG, Mr. Kristian Salinas, President of QFest, and Mr. Mike Ator & Mr. Jim Jackson of SPRY were all on hand to accept a $4,500 check, each, from Mr. John Danielson III, Diana President, which was held at Guava Lamp Modern Lounge at 570 Waugh Dr, Houston, Texas. To view photos from this event, visit us on Facebook.